A stylish, minimalistically beautiful vacuum-sealed bottle, which I accepted for evaluation based entirely on its strikingly attractive appearance. Gym accessories are all the rage, and if it's important to you to display your unerring good taste in all fitness-related things, then this bottle will delight you. In person it is undeniably cool, entirely made of brushed stainless steel, with the brand name tastefully printed in sky-blue near the bottom. I even like the name, Cayman Fitness … it conjures up memories of being tanned and fit on a lovely beach. Apart from its top quality appearance, drinking from it is a pleasure. Bottled water tastes so much better from this bottle. Once you get used to the fresh, clean taste, it's very difficult to accept plastic again. I take it with me pool-side full of cold water or iced tea and have enough to keep me hydrated for a couple of hours, even under the hottest sun. At night I keep it beside the bed as a much more hygienic alternative to a glass of water. A gorgeous bottle that performs equally well hot or cold. 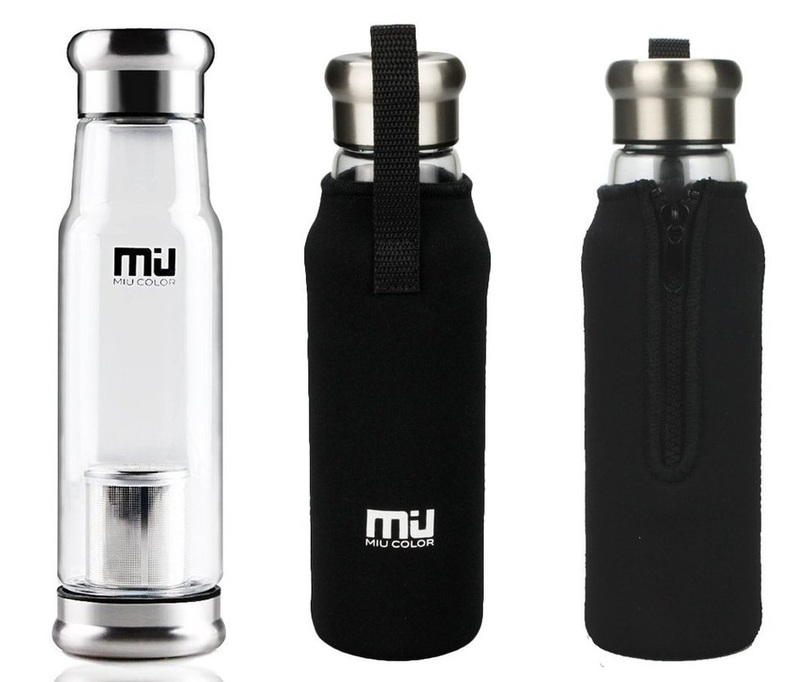 A gorgeous, elegant bottle inside a practical, grippy cover with a handy nylon loop. When I was offered this super-cool item to try out and review, I agreed purely based on the great appearance of both bottle and sleeve. It was only when I looked a little more closely into the composition of plastic bottles that I saw the benefits of carrying my drinking water around in a glass bottle. As far as durability, this bottle is made of Borosilicate glass, which, I discovered, is commonly known as Pyrex. It's a dense, strong glass that resists expansion and is, therefore, very safe for hot liquids. It is also very tough and not likely to break in normal use. The screw-top has a wonderful seal and the last little quarter-turn really gives me confidence that nothing will leak. Following recommendations, I washed bottle and sleeve before my first use. The difference in the taste of the water from this bottle is very noticeable. Once you get used to the fresh, clean taste, it's very difficult to accept plastic again. 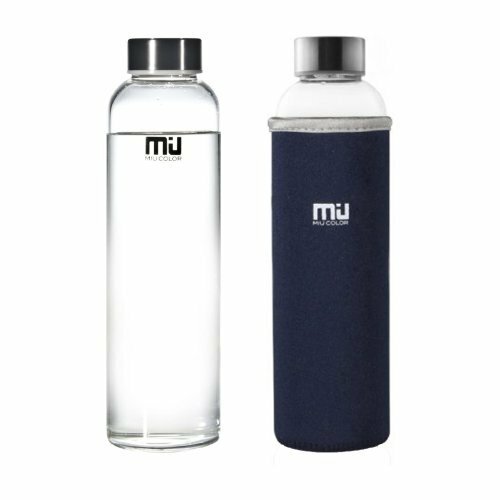 I had no idea I would become so fond of my Miu Color bottle! The nylon sleeve (mine is a beautiful, dark blue) fits snugly, provides padding, insulation and grip. I also love the two washing implements that are included in the purchase. I love my herbal teas and drink at least six cups a day. The problem is that most herbal teas should be infused for 4-5 minutes and, by that time, the tea has gone cold. To drink it hot I have to either leave the teabag in the cup, or drink the tisane at half strength. When I was offered this gorgeous bottle to review, I was curious to see how the built-in tea strainer basket would work. Now that I have had it for a couple of weeks, I would say that, for me, it is the perfect answer. Because it is made of Borosilicate glass, it can easily take boiling water and the sleeve helps to insulate the contents, so I can let my tea infuse for the correct time, and the second cup remains hot while I drink the first. Brilliant! I have tried it placing two teabags in the basket, but also cutting the teabags open and pouring the loose contents directly into the metal basket. Both work great but I actually prefer the loose tea option, as the fine mesh effectively retains all but the finest particles. It also works for fruit infusions, or if you like a slice of lemon or ginger root in your water. The seals between the glass and the top and bottom caps seem perfectly tight. I have noticed that, after leaving the hot liquid infusing, the top cap creates a bit of an air lock, so I have to take this into account when removing the cap. 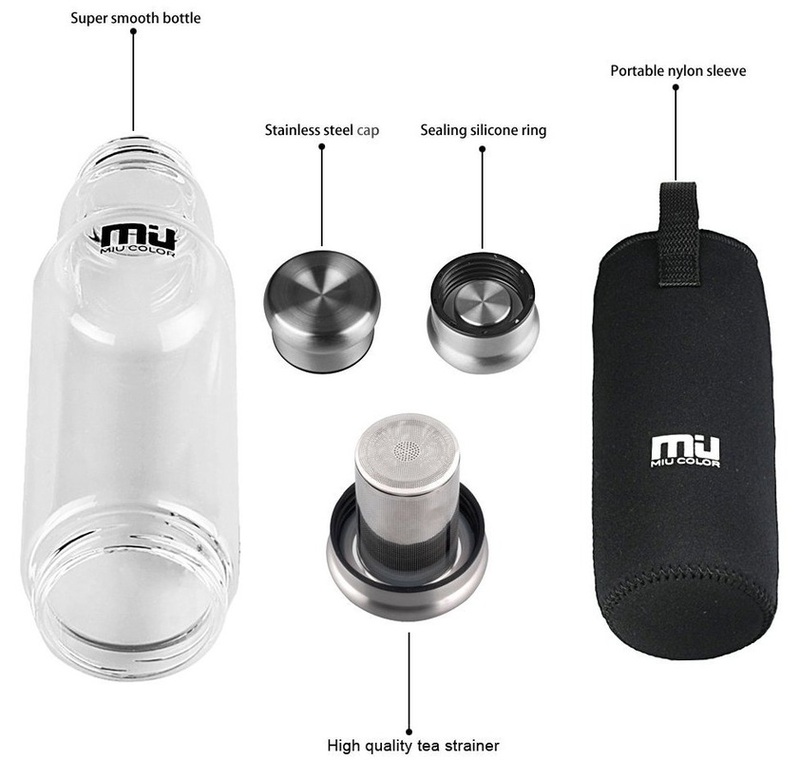 All the various parts are very easy to wash (make sure you do so before using it for the first time), and the padded sleeve makes the bottle easy to hold even when very hot. This bottle sits securely in my car's drink holder, despite being quite tall, and the loop is a handy little bonus feature. I also love the two washing implements that were included in the purchase. What I like best, apart from the really cool look and the general air of quality, is that the sleeve has a little zip, so it's really easy to slip it over the hot bottle without burning my fingers. I also love the super-smooth rim for when I drink directly from the bottle. A classy product that I am happy to use every day.